THERE'S A LOT OF NEW STUFF TO LOOK AT! Many thanks to Trudy Lane for loading all these resources onto the Pukorokoro Miranda website.Trudy also designed all of the poster resources, logos and a lot more. This poster, which you can download and print, tells of the risk level for 15 of our shorebirds. Trudy has left space at the bottom left for you to add your own message. 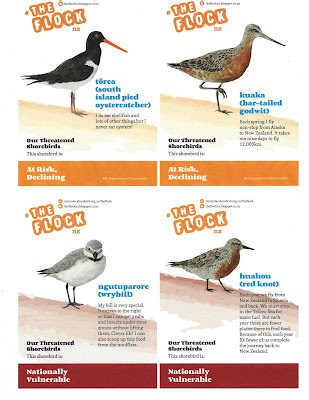 There is an A5 mini poster for each of the 15 shorebird species with a few facts about each of them. If you would like to know a little more there are 4 articles (Extinction is forever. Arctic migrants.Endemic species.Stilts) which you can download as PDF's. You will also find the FLOCK logo and font details you can use for your own FLOCK publicity. Here in NZ now it is School holiday time but, a while ago, the very first school to join the FLOCK had a surprise. 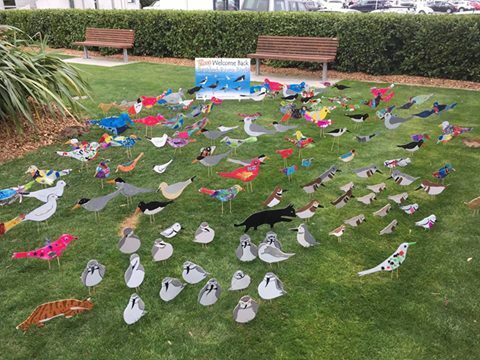 When the students from Kaiaua Primary arrived at school their FLOCK birds and many more had landed on the lawn. A welcome also to two more schools, Paparimu Primary and Peninsula Primary Te Atatu. Thanks also to Waikato Regional Council for posting this photo on their Face Book page. In this school holiday time we start to use the beaches a bit more. 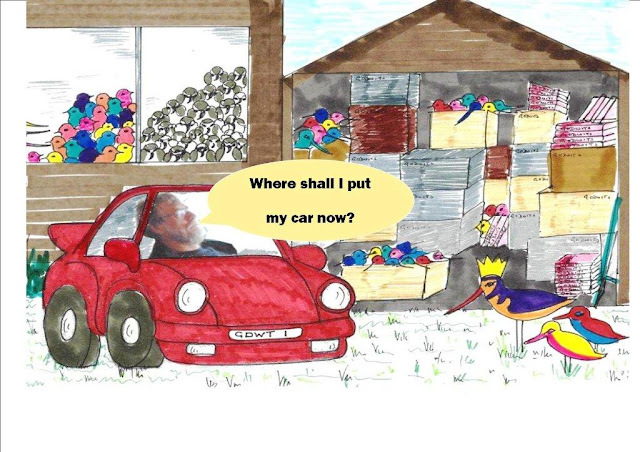 Now is when some birds are starting to nest. This pair of Variable Oystercatchers have an egg already. They can be very scary and will dive bomb you if you get too close to their nest or their chick. The NZ Dotterel also nests on the beach. Here the chick is being shaded from the sun. This quite beautiful video cartoon from Bird Life International shows how nesting birds react to us. These 300 birds came to roost in Hamilton Gardens yesterday as part of the Waikato Enviro Schools event. 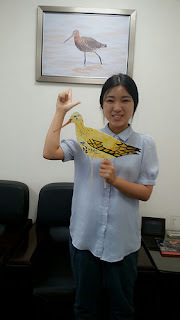 Krystal Glen, our PMNT educator (pmnteducator@gmail.com), was there to talk about two special birds, the wrybill and the bar-tailed godwit. She brought along binoculars for the students to use. Hidden among the FLOCK were numbered birds. The trick was first to spy them and then to identify their species. And scroll through the Devonport Flagstaff to pages 42-43 for an article about the Devonport FLOCK. 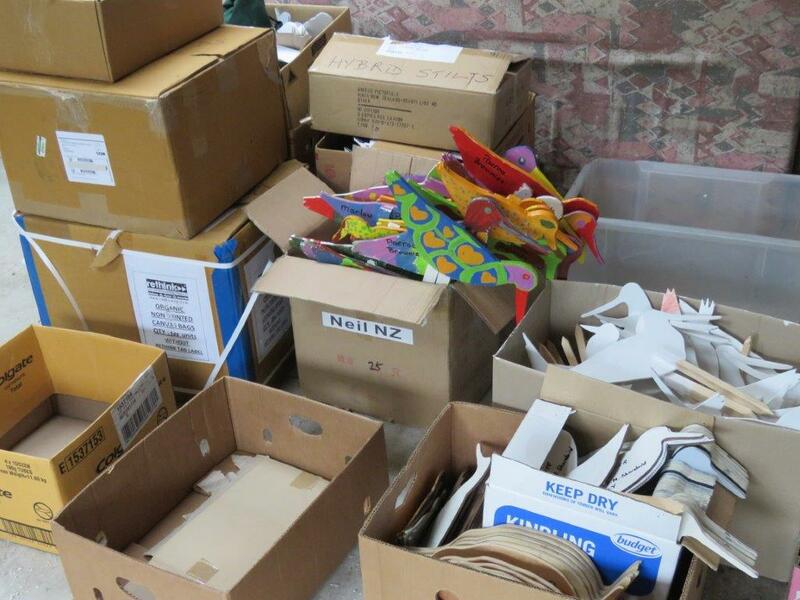 Every school on the Devonport Peninsula, Auckland North Shore, is involved. A big occasion is planned for November, more later. New schools are joining all the time.Welcome to the Avon-Heathcote Estuary Ihutai Trust Christchurch who have 5 schools helping them to build a FLOCK. 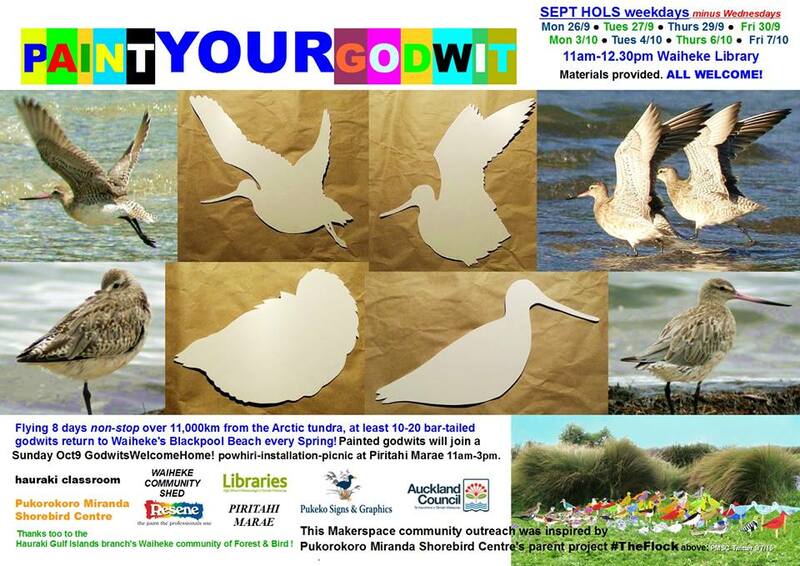 It will roost at the annual Farewell to the Godwits in February and they hope to sell their birds to raise money to fund a permanent flock of giant godwits for New Brighton. A really great idea. 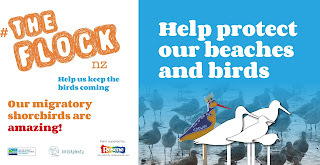 Also down in Christchurch the BRaid Flock has touched down at Christchurch airport and a few other places too! Watch out for them. 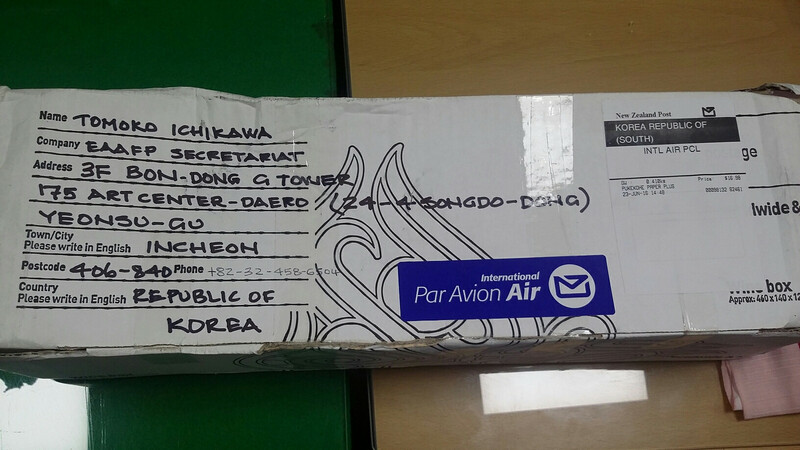 There is also news from overseas. 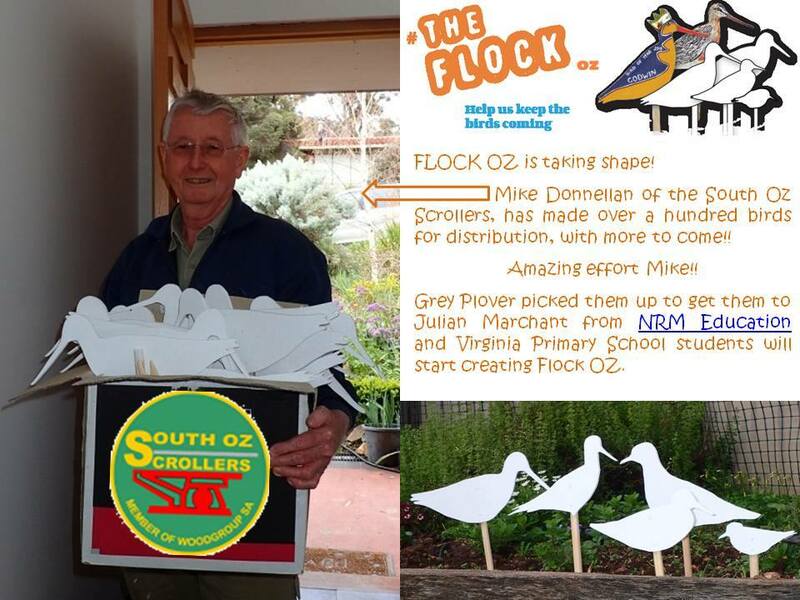 FLOCKOz is making lots of cut-outs for schools in Adelaide and along the Samphire Coast. We look forward to seeing their painted birds. Exciting developments from South Korea too. 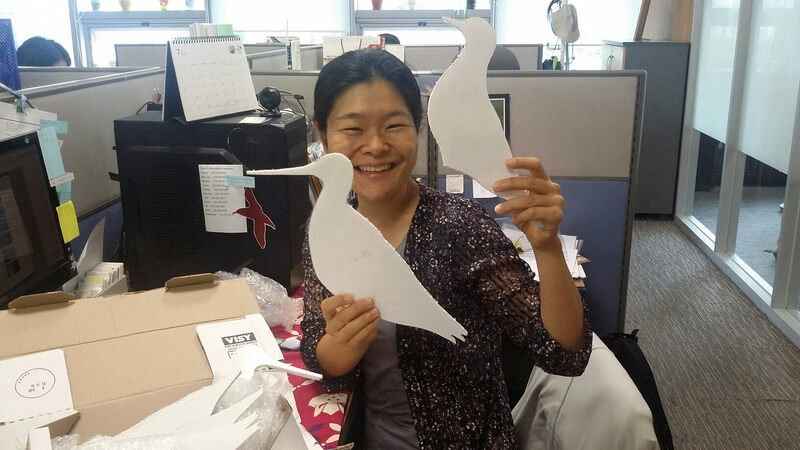 A while ago David Lawrie sent a small parcel of cut out birds to Tomoko-Ichikawa of the EAAFP Secretariat in Incheon, S Korea. This group co-ordinates the groups in the flyway that migratory birds use from NZ and Australia, through the Yellow Sea and on to Alaska and Siberia. The folk there were thrilled to get their parcel and enjoying making their FLOCK. We also hear from Andreas Kim that an ECO-class in the Muan Mongtan Middle School http://mongtan.ms.jne.kr/user/indexMain.action?siteId=mongtan_ms will be joining FLOCKNZ soon. 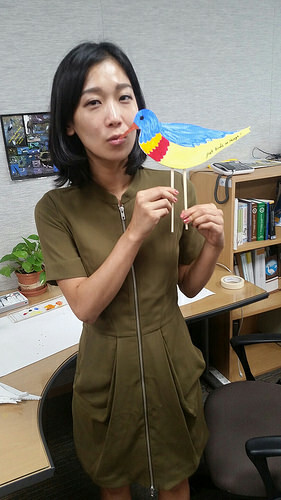 Andreas says that they would love to hear from some of you.For some of our migratory shorebirds the mudflats of S. Korea are very important re-fuelling stops on their journeys. 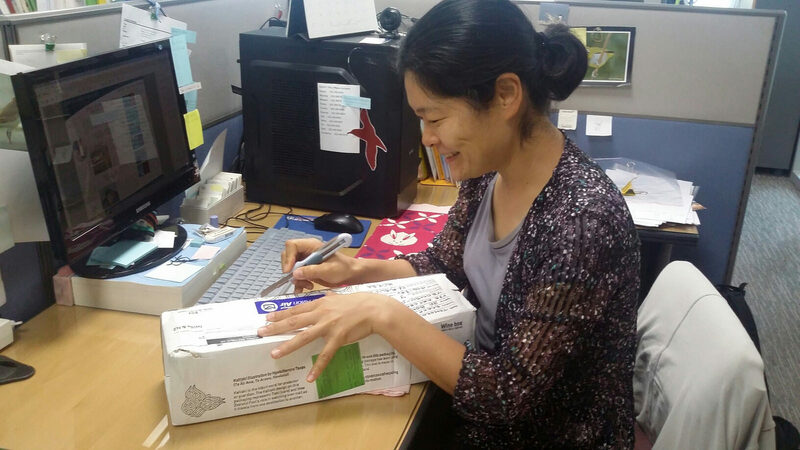 A very big welcome to Muan-Mongtan Middle School. 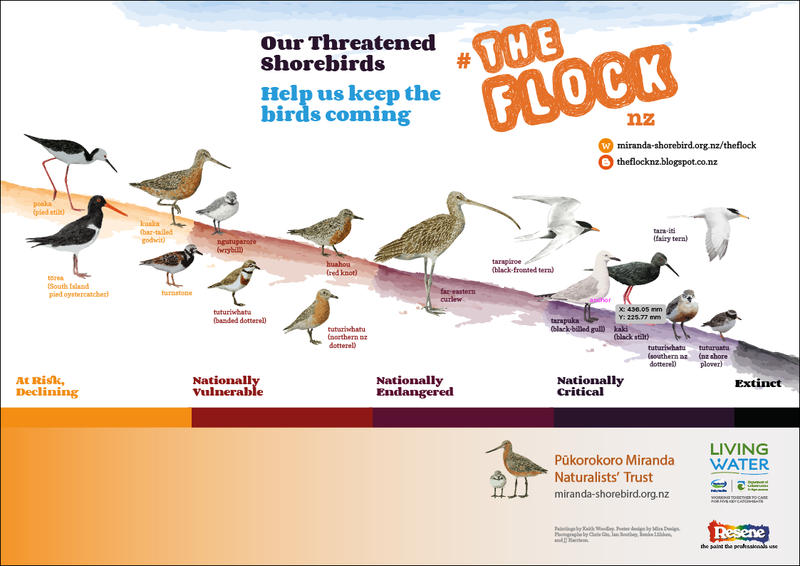 Just to finish here is a banner we have made to explain the situation our shorebirds are in. For the birds in the "Nationally Critical" group the next step is "Extinct". We know that our iconic brown kiwi is in trouble. It is 3 steps away from "Extinct", the same as the red knot on the poster. 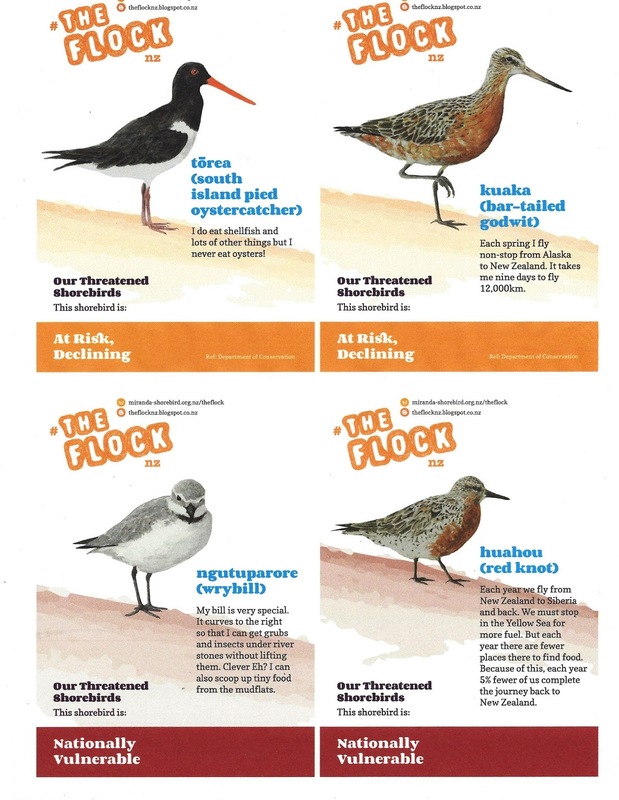 It is a real worry that so many of our shorebirds are only one step away from "Extinct"
Thank you for being part of the FLOCK, for helping to spread the message and caring about these special birds. Conservation Week has seen lots of FLOCK activity throughout the country. 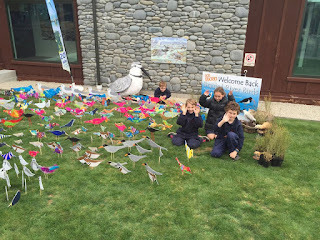 On 6th September, World Shorebird Day, years 3 and 4 from Te Puke Primary School had a great day at Newdick's Beach. They went with Karen to plant their 76 birds and newly made signs. Tania Bramley from Maketu Wetland Society was along to help them with identifying the birds. Carolyn from MOW also told them about predator control. It must have been a tiring day as they also helped Chris of Coast Care with some dune planting. 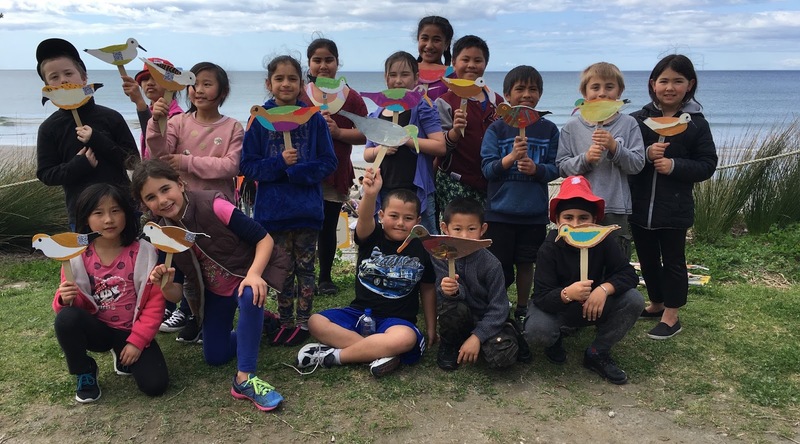 Well done Te Puke Primary! The BRaid Rivers Group had a great FLOCK Launch on 9th September with Rangiora Borough School bringing along their FLOCK. The party was hosted by Rangiora DOC. Sarah Ensor brought along their giant wrybill to join the party. 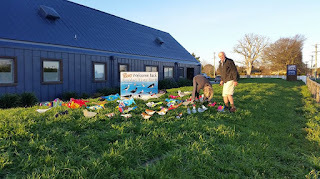 It was an important event and Waimakariri District Mayor, David Ayers, joined in the fun. Good work Rangiora Borough School. There have been happenings in the bay of Plenty. 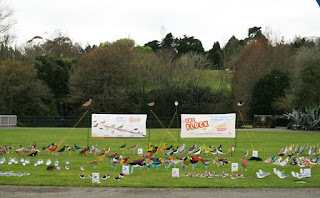 Birds of Plenty promote a great variety of bird related activities annually. Meg and Mike Collins of Ohiwa have been busy getting their "Flock A Plenty" organised. 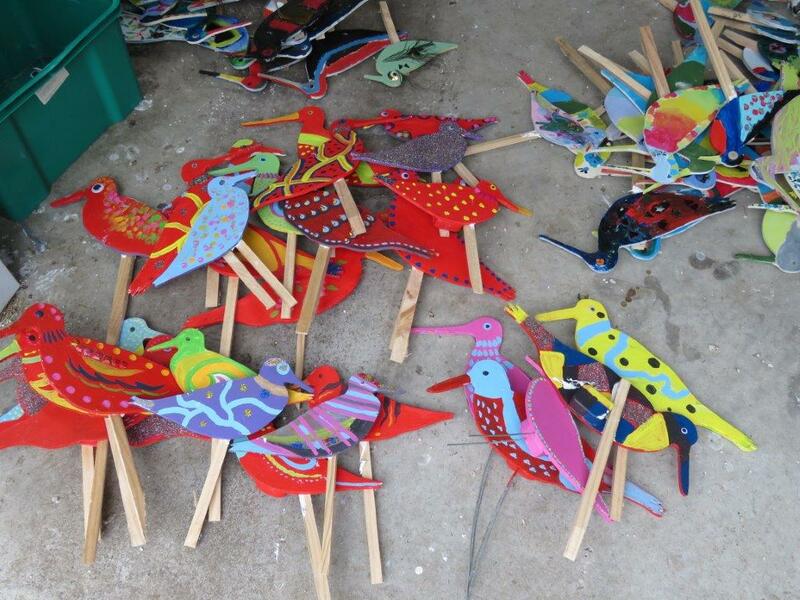 Five schools are involved so far, so there will be plenty of birds for their FLOCK launch on 2nd October. Already their beautiful sign has been erected at the beach. A little closer to home Karangahake School, near Thames, had their own FLOCK day. 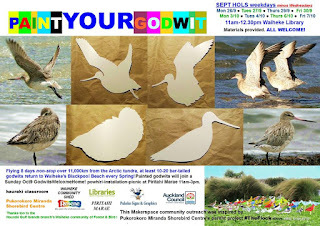 Krystal Glen, the Pukorokoro Miranda Shorebird educator, was pleased to be invited to talk about the birds and add some of her FLOCK to the display. 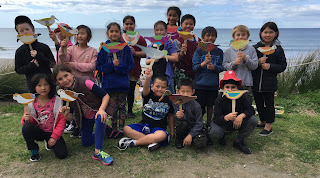 Super birds Karangahake School. There is just a little space to tell you about a threatened shorebird that is quite common in the Bay of Plenty over the summer. It is the banded dotterel. Most, but not all, of them breed in the South Island and come north for the winter. Some also go to Australia for the winter but they never breed there. 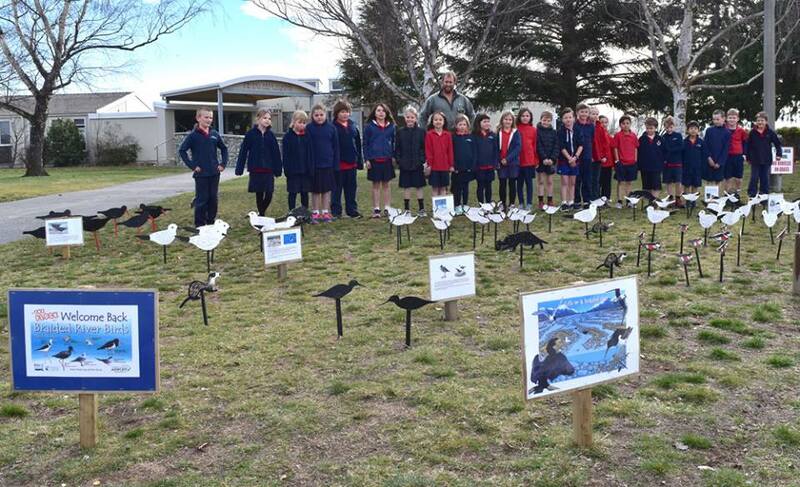 Twizel Area School has just launched it's own FLOCK. Well done to you. Also a strange happening, their big FLOCK has split in two. One half landed outside the Waimakariri District Council building just a few hours ago. and the other suddenly appeared outside the Rangiora Vet Centre. Are these Flash Flocks? Where will they appear next? The next few days are going to be very exciting. If you have something going on with your own FLOCK please let us know and we can share it with everyone. Each week we are having to up our estimate of the number of birds in THE FLOCK. In fact finding a place to store them all between FLOCK appearances is becoming a bit of a problem. They have taken over the garage at the Pukorokoro Miranda Shorebird Centre while Keith has been away. If there is no room for his car when he returns at least we have upgraded him to a Porcshe! (only on the cartoon though). A number of new schools have joined THE FLOCK project as a result of a visit from Krystal, our new PM educator. We welcome Dawson Primary, Wakaaranga Primary and St. Joseph's Paeroa. 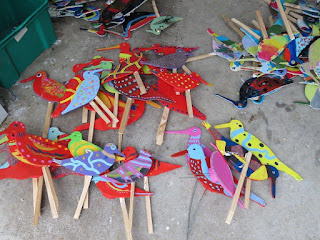 Also Year 3 from Oropi are making a Flock after seeing the amazing birds from Ruru's class. It's not just the young folk though. A community group from Waiheke Island, known as the Waiheke Classroom, is preparing 50 birds for THE FLOCK. 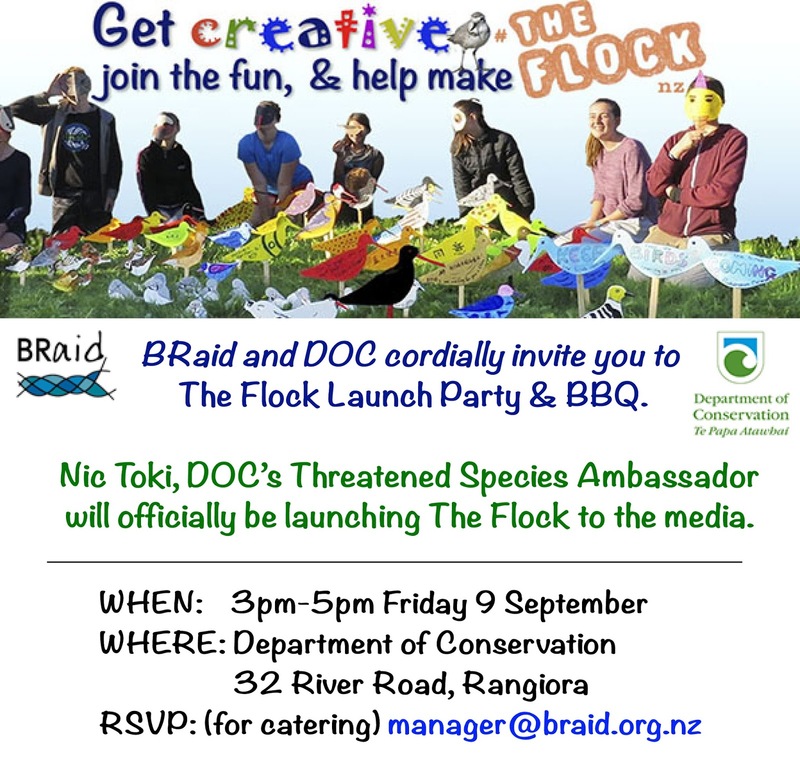 On the 21st of September at Hamilton Gardens there will be a FLOCK appearance at a one day EnviroSchools event. A few FLOCK birds are now in permanent residence at the Pukorokoro Miranda hide.Just look out and down through the window and you will see Ziggy Stardust and his plywood friends. Te Pihinga at Rangiora Borough School. 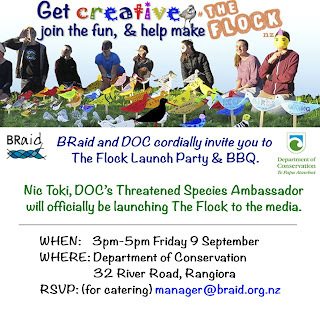 In just a few days on September 9th BRaid and DOC will be publicly launching their FLOCK with a bit of a party for all those who are involved. Meanwhile, over in Australia everything is moving at great speed. The Arctic migrants are returning very shortly to both our countries and we need our Flocks to be there to welcome them back.